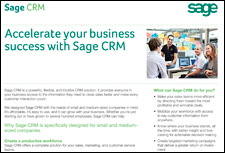 Sage CRM is an easy to use, fast to deploy, feature-rich client relationship management (CRM) system providing enterprise-wide access to vital customer information—anytime, anywhere. With Sage CRM, you can better manage your business by integrating field sales, internal sales, customer care, and marketing information. Take complete control of your sales pipeline by empowering sales teams to effectively manage, forecast and report on all phases of the sales cycle. Track the ROI of your marketing programs by automating, tracking and analyzing every marketing campaign, from one-time e-mail communications to multi-faceted marketing programs. Make the most of every customer interaction by ensuring customer satisfaction and even allowing your customers to help themselves. Microsoft Outlook Integration Why ever leave Outlook? Sage CRM for Sage 300 ERP (formerly Sage Accpac) runs within the framework of your Microsoft Outlook and has complete, two-way synchronization with Outlook contacts, calendar (appointments) and tasks, in addition to enhanced e-mail integration. The benefits of real-time access to your CRM system are numerous and can have a positive impact on your business performance and profits. A comprehensive client relationship management solution enables organizations to guarantee their sales and customer care professionals have access to critical data – regardless of whether or not they have an internet connection. 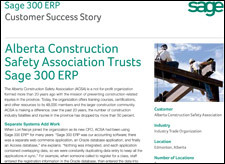 Sage CRM has sophisticated Automated Process Workflow and Customization capabilities as well as Computer Telephony Integration, Web Self Service and more. 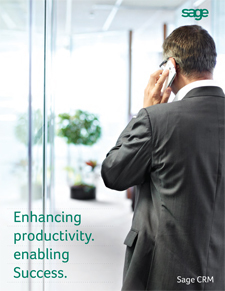 Contact us about how your business can improve productivity, envision success and accelerate growth with Sage CRM. It’s time to turn your business dreams into reality.